On left: Clancy waiting his turn to dock dive at “The Andersons” in Ohio. On right: Clancy dock diving at Maryland Dogfest. 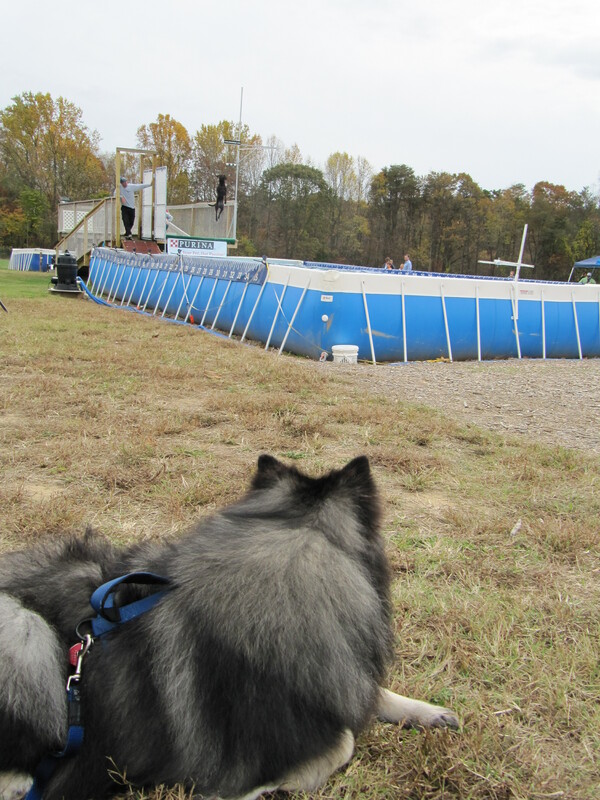 “Here is a treat that you never see in the sport of dock diving… a Keeshond!” exclaimed Milt Wilcox, the founder of Ultimate Air Dogs dock diving, to the audience as I lead Clancy onto the dock platform leading to the approximately 40 foot long pool. While you will see a lot of Labs and lately the Belgian Malinois dominating the dog dock diving sports, the dynamics of the professional dock diving leagues encourages any water loving dog to join in the fun. Every kind of dog has a chance to not only enjoy just participating in the sport, but also there is ample opportunity to actually compete for recognition and prizes (in some cases), because of the jumping distance divisions. 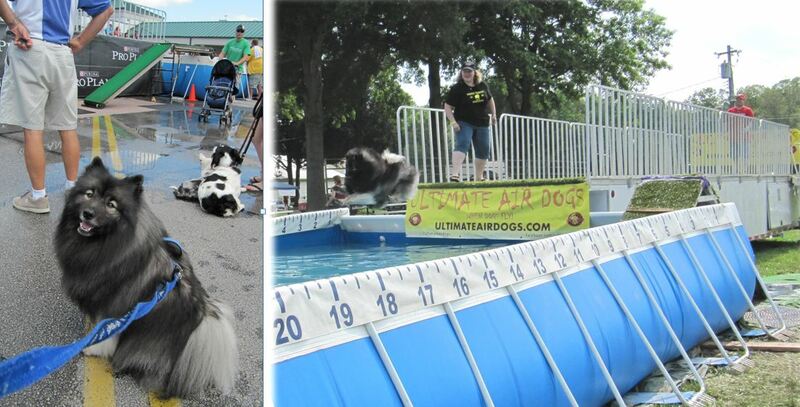 This allows Sheepdogs, Dachshunds, Great Danes and even the Yorkie to enjoy the cheers of an audience as they fly weightless through the air before submerging themselves in a cool body of water. Two years ago, while cleaning up the spilled water around Clancy’s water bowl, I questioned myself “why did I choose the puppy that was digging the water out of the water dish?” (Which when given the opportunity, he still does to this day!) Perhaps it was a sign of destiny. Just one week after bringing our new Keeshond puppy home, we headed to the lake house my husband grew up at in Michigan. Our 9 week old Kees puppy took to the lake immediately and he went for his first swim. 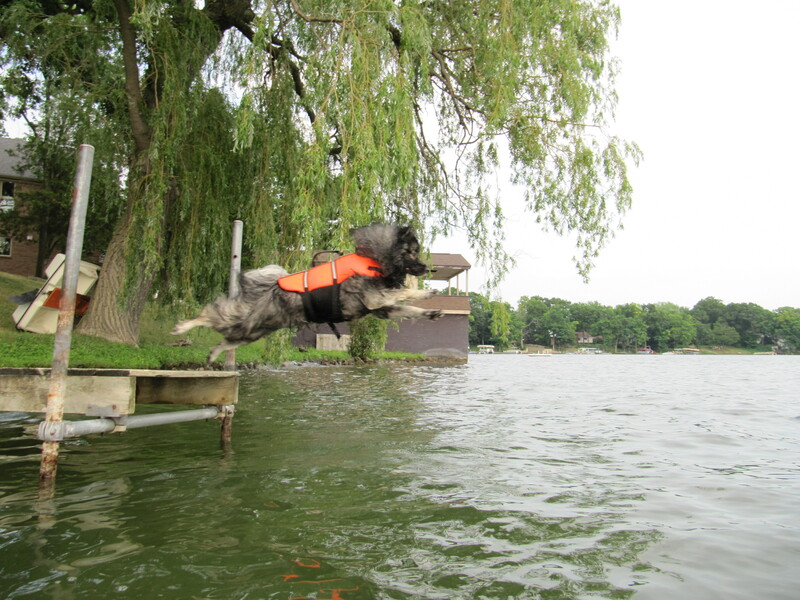 Clancy has always loved the water… any dog who who enjoys the water can enjoy dock diving! At nearly 6 months old, Clancy loved swimming and retrieving, but couldn’t be convinced to jump off of the dock yet. Several months later, we vacationed on another lake and Clancy immediately was eager to get in the water. We did get him a life jacket to give him more stamina in the water. All that fur can weigh a Kees down! We tried to encourage him to jump off the dock into the water, but instead he would run back to shore and then swim out to retrieve his stick. The following summer, we returned to my mother-in-law’s lake house in Michigan and wanted to see if we could get Clancy to jump off the dock into the lake. We ran down the dock with Clancy at our feet and jumped in ourselves. Clancy put on the brakes and bowed at the end of the dock, barking ecstatically at us in the water just ahead of him. I slapped the water and encouraged him to jump in. The “Velcro dog’s” (one of a few nick-names for a Keeshond) desire to re-attach himself to us took over, so Clancy stopped barking and took the leap of faith! As I talked about our vacation to a local dog lover, they encouraged me to try the sport of dock diving and told me about a facility that had the regulation size dock and pool that had open practices not too far from where we lived. Just for fun, I headed there with Clancy, not even considering competition. After all, I thought a Keeshond could never be in the same league as the Labs, Retrievers and other “sporting dogs”. Well, Clancy didn’t know he was a “non-sporting” breed and leapt off the dock with just as much enthusiasm! As Keeshond owners know, we get all kinds of attention when we’re out in public with our unique smiling fluff-balls. Seeing a Keeshond take part in dock diving makes everyone do a double-take! “That fluffy dog can’t swim, can it?” Yes, he can swim very well! “You can’t let that coat get wet, it will take days to dry!” Actually, it dries quite quickly and as long as you groom him before getting wet, it’s not difficult to turn him back into a big fluff-ball. Everyone enjoys seeing the transformation of the dry Kees versus the wet Kees too! It’s almost like one dog goes in and a different dog climbs out… with gallons of water pouring off the coat. Probably the biggest workout of it all for Clancy is the climb out of the pool with his saturated coat adding all that extra weight. Clancy’s transformation of being a dry Keeshond to wet to mostly dry again in less than a half hour! Socializing with the dock dog enthusiasts, they encouraged me to compete with Clancy. 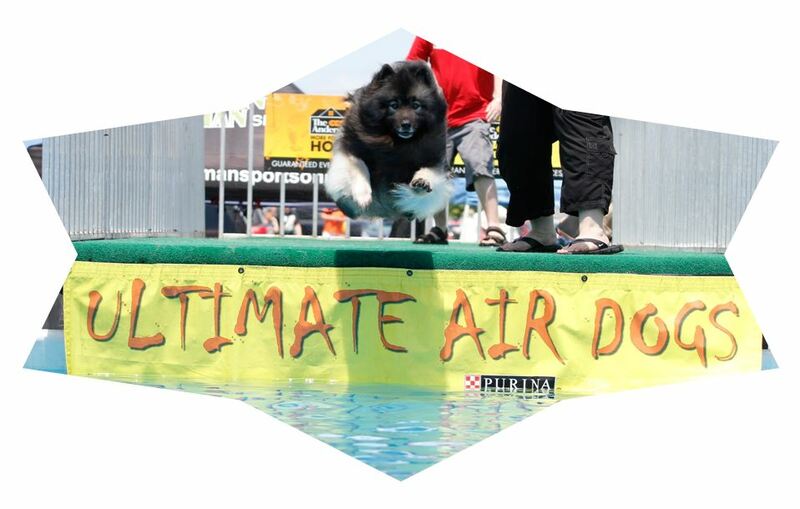 I learned there are a few different dock diving organizations in the United States which are Ultimate Air Dogs (UAD) (www.ultimateairdogs.com), Dock Dogs (www.dockdogs.com) and Splash Dogs (www.splashdogs.com). While there are some differences in the rules and other logistics, they all offer multiple divisions in order to allow dogs to be competitive at the level they jump. This encourages any dog to be able to participate. For the “Novice level” jumpers range from 1″ (yes, I said one inch!) to 9’11”, “Junior division” jumpers are in the 10′ to 14’11” range, “Senior division” is from 15′ to 19’11” and so on. There’s even a “lap dog” league for the small dogs to not get their egos hurt, though some of those lil’ guys can fly! The top 5 dogs from each division at the end of each weekend event then get to compete for 1st, 2nd and 3rd place in a divisional finals. Clancy recently won 2nd place in the Junior division at the Ultimate Air Dogs Maryland Dogfest event! During the Maryland Dogfest event a few weeks ago, Clancy was acknowledged by the owners of Ultimate Air Dogs for having the longest jump on record for a Keeshond, at 12 feet and 10 inches! While there have only been a sprinkling of Keeshond appearances in the professional dock diving world, it is still a fun record to have! 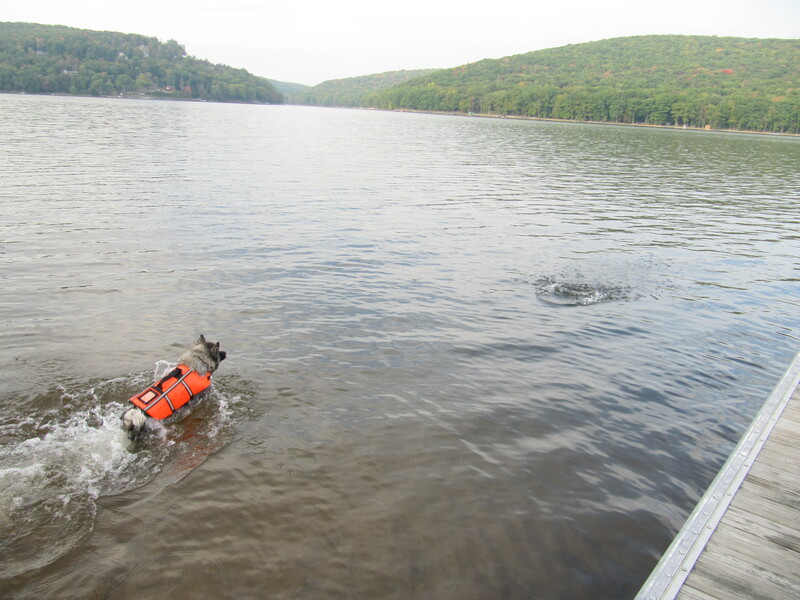 On a future blog post, I will dive a little deeper (pun not intended, but it is funny) into comparing the different dock diving organizations and will offer some insight on how you can give your pup the opportunity to fly! If you’re looking for a fun way to enjoy the warm weather with your dog, or perhaps a little out of the ordinary competition, consider dock diving with your fur-pal. If you have a Kees or other long-haired breed, just be prepared for at least a 6 foot splash and shake zone! 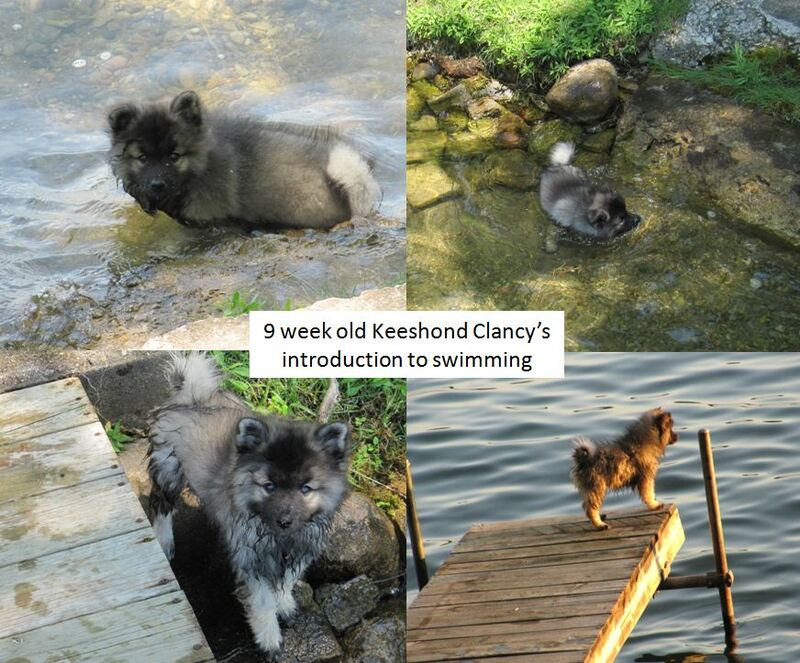 Categories Clancy ~ My Keeshond, Dog Sports, Keeshond stuff, Uncategorized, Videos starring Clancy the Keeshond!